Popular HGTV home renovation show ‘Income Property’ urgently needed a waterproofing solution and they knew the waterproofing professionals of Duradek could provide it. 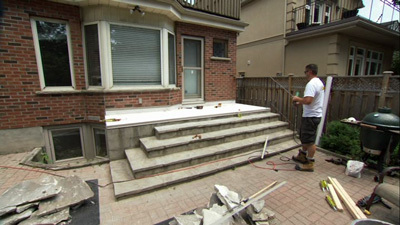 Host, Scott McGillivray and his team were working on a complete basement renovation to create a rentable income suite so the new owners could afford the home, and with a new baby coming there was no time to waste and no money to spare. Everybody was excited about the plans and even the electrical upgrades and asbestos removal wasn’t cause for concern. It was when they were removing the ceiling panels that enthusiasm was dampened. And dampened was exactly what had happened to the framework of the home. Initially, the source of the moisture was unknown, but at some point a corner-cutting contractor had cut a tubing pipe in half to act as a channel to route accumulated water from its unknown source through the ceiling and down the wall to a drainage pipe. You don’t have to be a building expert to know that method is not an ideal water management solution, but the real concern now was that until the source of the water infiltration was found, any and all efforts they invested into the basement renovation would be wasted. The affordability of the house without the income suite was not realistic and having taken on a huge mortgage, the owners were in a very vulnerable position. Scott McGillivray knew this critical element must be solved before proceeding. Through testing by applying water to the suspected points of entry, Scott determined that the water was entering the home through the flagstone back porch entryway that was situated over the suite. This is an unfortunately common problem when builders who are not waterproofing specialists mistakenly assume the stone and mortar will be enough to stop water infiltration, but over time water will always make its way through. One of Scott’s team members recalled using Duradek on a previous project and knew it was a reliable method of waterproofing, so they decided to try using a Duradek vinyl membrane and then laying the flagstone pavers on top of it. When the show contacted Duradek to help supply this important building material for episode 8, Sales Manager Kevin MacMillan was able to offer something even better suited for their project – Duradek Ultra Tiledek. Rolling out the Tiledek membrane. Tiledek was the perfect solution for this problem and a better option than laying the flagstone pavers over top of the original walkable Duradek vinyl membrane. Tiledek is made with the same quality PVC and is applied with the same professional waterproofing details as the original Duradek membrane. It even comes with a 10 year waterproofing warranty like the original Duradek and Tiledek has been tested and approved as a roofing membrane. The feature that made Tiledek the superior solution for this project is that Tiledek is manufactured with a fabric-embedded surface intended to accept a thin set mortar to adhere a final walking surface like tile or the flagstone pavers. So on this project, Tiledek was the best solution for providing a 100% waterproof system. The Duradek Ultra Tiledek was installed by HTR Duradek in Ontario; one of Duradek’s leading authorized installers. All Duradek waterproofing systems are available only through authorized installers that have been trained in the intricate details involved in the specialty trade of deck waterproofing. perimeter details on Tiledek installation. on outside perimeter on Tiledek installation. Only after the membrane was securely installed with all of the proper attention to the perimeter and drainage details could the stone layers come in to finish the job. Fortunately, with Tiledek membranes, once it is installed there is no drying or curing time required and the stone layers could start their part of the project immediately with no time delays to keep the project on track. can get to work right away to finish the job. With the water infiltration resolved, the rest of the renovation was completed and the owners could proceed with finding a tenant for their beautiful new suite to help them afford the home where they can raise their family. 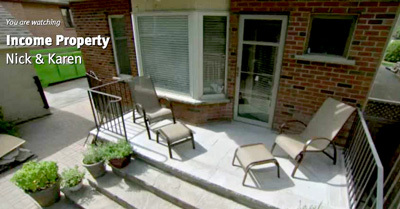 To view this Income Property episode, visit HGTV Canada online and watch Season 8, episode 8 ‘Nick and Karen’. For HGTV US, watch for airing of this episode on Tuesday, November 12th, 2013. If there’s any information you take away from this episode, remember that out of all the renovation items on your wish list, the most critical one to deal with is proper waterproofing. If you’ve got questions about your own waterproofing issues or decking projects, contact a Duradek Dealer near you for a free estimate.